Enjoy this one for what it is, a well-made heist flick. “Widows” is the first film from Oscar-nominated director Steve McQueen since taking best picture for “12 Years a Slave.” It is also the first McQueen film without muse Michael Fassbender. From the unforgettable opening moments (the first of many expertly edited sequences) “Widows” introduces itself as a monster of a thriller comparable to “Heat” or “The Departed.” While “Widows” isn’t really a performance film, Viola Davis has now proved she can lead an action film (I never doubted her for a second). Some of the supporting casting is questionable, but it’s the technical elements of “Widows” that deserve the most recognition. Four widows are made when four longtime Chicago criminals are finally taken down by police. In their time of mourning the women are threatened by The Manning brothers, and demand to be repaid for what their husbands stole. Veronica Rawlings (Davis) was the wife of Harry (Liam Neeson) the ringleader. She uncovers his mastermind plans in a notebook that she refuses to turn over. Instead, she puts together a plan to get them out of their dire situation. Jack Mulligan (Colin Farrell) is taking over politics for his father (Robert Duval), and his competition is The Manning brothers, both equally corrupt and self-serving.These families and interests collide over money and power, and none on the right side of the law. “Widows” strength is the life it breathes into a genre that’s too long been male-dominated. There is a scene in “Widows” that isn’t entirely integral to the plot, yet McQueen pulls off one of the most surprising long shots by simply looking at a scene in a moving car differently. Its small touches such as these, coming from an artistically gifted director with a mainstream budget, that produce a film that is absolutely electric. It would be a mistake to compare “Widows” with this Summer’s forgettable “Oceans 8” simply because they are both female heist films. 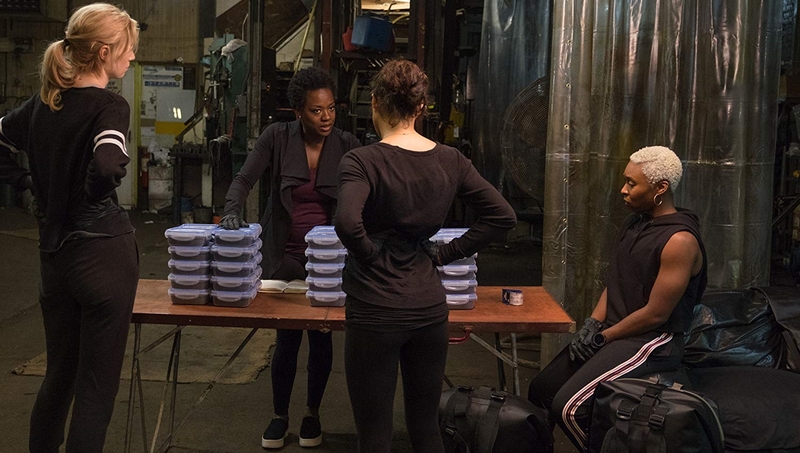 One plays safe while “Widows” boldly tests the limits of the genre. “Widows” isn’t an action movie, the majority of the story sets up the heist, but it’s the scripts subtly commentary on political corruption that elevates it beyond the norm. For all the strength and leadership in Davis (“Fences”) performance, the standout is “Guardians of the Galaxy” star Elizabeth Debicki whose character has her own arc. The weakest link here is Rodriguez and the script seems to show that, denying her character equal screen time despite the high marquee name placement. Perhaps she is just in the film to draw in some of the “Fast & Furious” fans? Another drawback to “Widows,” the abnormal abundance of f-bombs in the script. At times it feels like McQueen has a quota he is trying to reach, and they are forcibly dispatched. “Widows” strength is the life it breathes into a genre that’s too long been male-dominated. The technical masterwork of this thriller make it one of the seasons most entertaining.